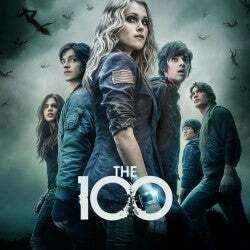 An interview with The 100 EP Jason Rothberg was clipped on the Morning Spoilers before part two of the season finale: "Remember how you felt at the end of Season 1, when you first saw Clarke wake up in that "mysterious white room" and had no idea what was coming next? That's pretty much how you're going to feel during the final scene of the Season 2 finale." Yep. You definitely can say that. Maybe Clarke, Lincoln, Octavia and Indra are going to wander the desert for a while, or perhaps Lincoln and Octavia will stay at Camp Jaha? How the hell did the hologram get a bomb into the mansion? Does she also have an army of Reapers? What's her power source? The lighthouse runs off of a solar panel — I've installed a few solar panels myself and that's some futuristic as hell power to run the bachelor pad. What kind of distance do you think they can get out of the drones? Remember, one was on the other side of the ocean, so I'm guessing it might be able to get back to camp. What was up with the Tremors creature and if it was following vibrations, why did it stop when it was full? If anybody wants to do a proper recap, maybe they'll share it to io9. I've never really written one myself, but that doesn't stop me from wanting to say, "Damn. That was good." ETA: IGN has a post-finale interview with Rothberg that adds some interesting notes.